If you have server versions 5.0 or 5.1, you can open an archived version of this article here . If you have server versions 4.7 or earlier, you can open an archived version of this article here . Your company’s tone of voice — how the character of your business comes through in the words you write — can make a lasting impression on anyone who reads your content. 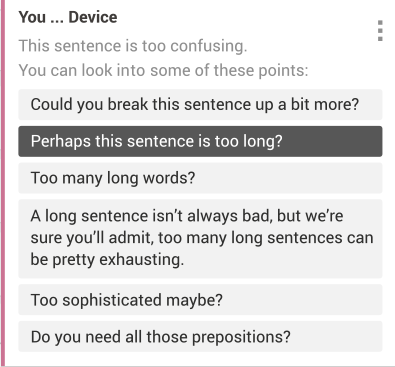 Here at Acrolinx, we can use our linguistic analytics platform to measure the clarity, and conversational tone of your content. We don't just provide metrics — we also give you specific guidance on how to change your content so that it has the level of clarity and conversational tone that's most suitable for your audience type. You can use audience types to give your writers an idea of what tone of voice they should aim for. Your Acrolinx guidance package comes installed with an audience type called "Standard." You can update this audience type if it isn't suitable for your content. To set up a new audience type, we've provided two categories, Clarity and Conversational Tone . Choose which level of clarity best suits your audience. You can choose to turn conversational tone on or off for your audience. For example, if your audience is server administrators who are trying to follow a complex technical procedure, you might want Clarity set to complex and Conversational Tone set to off . You might call this audience type something like "Technical" or "Administrators". When writers check content, they can open the scorecard and see if their content corresponds to the tone of voice under Summary . In the previous illustration, there are three issues that can be improved for clarity and seven issues that can be improved for conversational tone. If you use checking profiles, you can add several audience types for different writers . Create a new audience type called Marketing. Choose the clarity and conversational tone for that audience. 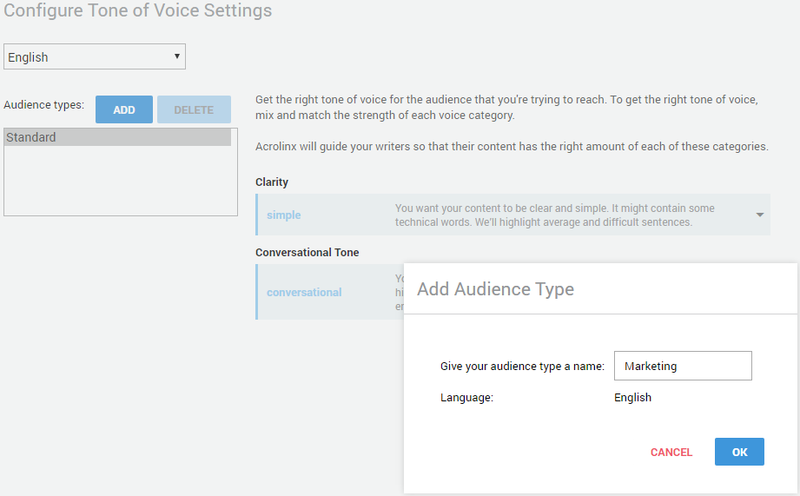 Assign the new audience type to your writers. You do this by assigning a checking profile to your marketing writers . In the checking profile, set the Target Audience type to Marketing. If you don’t use checking profiles, you can only edit the "Standard" audience type. This basically means you can only target one type of audience at a time with the same tone of voice for all content. If you use checking profiles, you can add different audience types. If you don't use checking profiles, you can still edit the "standard" audience type that comes with every guidance package. Navigate to Guidance Settings > Tone of Voice , and select your language. To add more audience types, click Add . You can only add extra audience types if you use checking profiles. 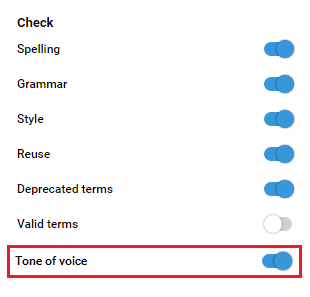 To edit an audience type, select the name of that audience type and update the tone of voice settings. You do this by adjusting the drop-downs to mix and match the tone of voice. If you use checking profiles, you can add multiple audience types. If you no longer require an audience type, you can easily delete it in the Dashboard. Select a name from the list of Audience Types . When we talk about tone of voice, we'll discuss two different ways that Acrolinx can help: metrics and guidance. When you run a check and open the Acrolinx Scorecard, you'll see a section called Metrics . This section shows you your tone of voice broken down into specific characteristics. You get a metric for each characteristic. These metrics help you develop the right tone of voice for your audience type. And, while there’s no one-size-fits-all approach — one company’s ideal tone of voice may not be at all appropriate for another — it’s important to figure out what tone of voice works for your audience, and then to ensure that you’re consistently writing in that tone of voice. To help you figure out which parts of your content need improvement, Acrolinx gives you specific guidance on how to change your content so that it has the tone of voice that's most suitable for your audience type. You open your editor, check your content, and in the Acrolinx sidebar you'll see specific hints on what sentences you should change to get the right level of clarity. For now, the guidance offered is for clarity and conversational tone. Note that you won't get this kind of guidance in the classic-edition integrations. This feature only works with the sidebar-edition of our integrations. We set up the scoring for you and include it in your guidance package (formerly linguistic resources ). If you'd like to check for another characteristic that isn't already in your guidance package, you can ask our professional services team to set it up for you. When checking content with Acrolinx, you don’t need to do anything extra to get scores for your tone of voice. After you install your guidance package, you'll see the scores for each voice characteristic on the Acrolinx Scorecard under Metrics. For some characteristics, there are special word lists that influence the score. For example, we have a list of words that are overused in marketing copy. These words reduce the liveliness of a document. You can ask the professional services team to customize these lists for you when they set up your guidance package. You can create audience types and assign them to your writers so that they know when to change the tone of voice of their content. If you want to temporarily turn off voice scores, you can turn off voice scores in the core server properties. Your tone of voice is made up of several characteristics. You receive scores based on how much your content includes each of these characteristics. For example, your Acrolinx guidance package might be configured to check for clarity, liveliness, and informality. You can ask your Acrolinx professional services team to include more characteristics in your guidance package. For some people, the scores for individual voice characteristics are more distracting than helpful. This might be the case if tone of voice isn’t your primary focus and you just want to check for the basics such as style and terminology. In this case, you can turn off the scores for the voice characteristics so that they don't show up in your scorecard. You turn of these scores by updating your core server properties. When this property isn’t present in the core server properties, the default value is true . There are some kinds of words that can affect different voice characteristics. For example, the clarity of your content can suffer when you use complex words. You can ask the Acrolinx professional services team to add a list of complex words to your guidance package. 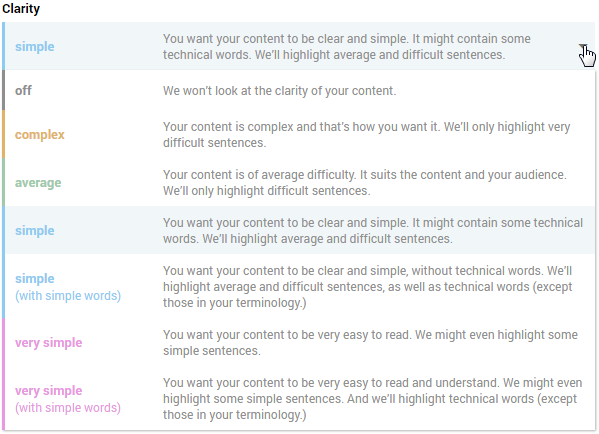 Content that contains words from your "complex words" list will get a lower clarity metric. The Acrolinx professional services team names each word list when they add them to your guidance package. This name tells you which characteristic the word list applies to. For example, a word list for clarity would be called something like "Complex words for clarity". As mentioned earlier — Acrolinx doesn't just give you tone of voice metrics — you also get guidance on how to change your content. For now, you get guidance on how to improve the clarity of your content, but we're working on including the other characteristics as well. You'll get the guidance in the Acrolinx sidebar whenever you check your content with Acrolinx. You need to use a sidebar-edition of your preferred integration. And, you need to make sure that the Tone of voice option is selected in your checking options. Once you check your content, Acrolinx shows you potential tone of voice issues with special cards in the sidebar. These cards are magenta colored and work a little differently to other cards. For most issue types, each card corresponds to one individual issue in the content. When you click the card, Acrolinx highlights the relevant text in your content. For tone of voice, each card corresponds to an entire sentence that might contain several issues. When you click the card, the card expands to show you hints about the clarity issues in your sentence. Acrolinx doesn't provide suggestions for these issues because they usually don't have straightforward solutions. Acrolinx provides you with hints on how to improve the clarity, but we leave the editing to you.